How to Import to Cambodia? What are the import procedures in Cambodia to move goods? Explain about import registration process, cargo movement to Cambodia from overseas countries, Import delivery process in Cambodia etc. Detail the import methodology in Cambodia. How to import to Cambodia? This post explains about step by step procedures that need to be finished with Cambodia government authority for importation to Cambodia. Both importers and exporters first need to register with Cambodia’s Department of Business Registration, under the Ministry of Commerce. This enables them to proceed with international business. A trade license is required for import or export of goods for commercial purpose from and into Cambodia. General Department of Customs and Excise of Cambodia, under the Ministry of Economy and Finance is the authority that manages and controls the customs related operations in the country. The Importers and exporters must register with the General Department of Customs and Excise. Importers and exporters need to register their value added tax (VAT) accounts with the General Department of Taxation to obtain a TIN number which further requires for registering with ASYCUDA system. The Electronic lodgement of Customs Declaration (Single Administration Document-SAD) can submitted directly through new automated customs processing system called Automated System on Customs Data (ASYCUDA). The efficiency of the Customs Clearance process is depend on having the valid documents, the accuracy of the information provided in the documents as well as the promptness in submitting the documents and filing the necessary applications for the Customs Clearance. 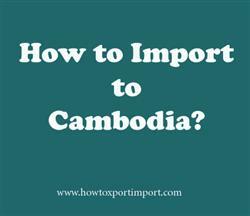 This post explains about different phases in import process that every importer needs to go through in Cambodia. Formalities for import to Sihanoukville. Procedures to import to Siem Reap. Need to import to PHNOM PENH. Explain to import to KAMPONGSOM . Information to import to Sihanoukville. Step by step process to import to Siem Reap. Methods to import to PHNOM PENH. Guidelines to import to SihanoukvillePlease guide to import to KAMPONGSOM . Help to import to. Procedures required to import to Siem Reap. Requirements to import to PHNOM PENH. Clarifications to import to Sihanoukville. How can I import to KAMPONGSOM . What should I do to import to Siem Reap. How to import to KAMPONGSOM? How to import to India from Cambodia? How to export from Cambodia?